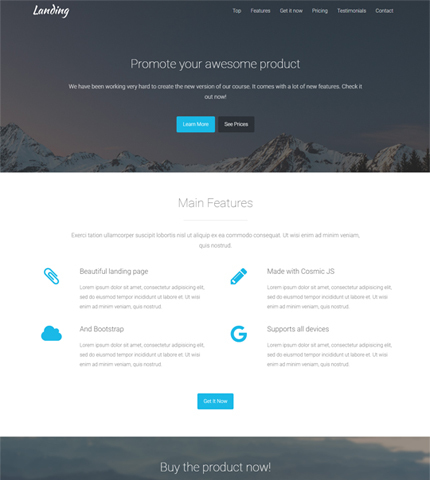 Unlike the majority of landing page templates available here on AZMIND which are simple HTML, this one is a bit different: it’s based on Cosmic JS which serves as a CMS (content management system) and stores all your content that will be shown in the landing page, just like WordPress but with some differences (more on this later). As we’ll see below, this new template comes with various sections which can be activated / deactivated and sorted as you like on the page. Let’s first explain what Cosmic JS is and, after that, we can see the new template and it’s features. We can think of Cosmic JS as a CMS (content management system), just like WordPress, but a bit different. Cosmic JS is cloud-based and API-first. With it you can access content from wherever you want and from whatever platform or programming language. And it supports many platforms and programming languages! In this template I’ve used PHP to access the content, for example. These let you create your own data structure where you can store your content, which is delivered via an API endpoint and can be accessed from any programming language or device. To learn more about these “abstract” concepts, check out the “getting started” page. And here is a video tutorial that explains how to get started with Cosmic JS. On the official website you can find more documentation and resources. Here is how my dashboard looks like for this template. There are various object types. Each section of the page is an object of a certain type, called “Section 1”, “Section 2” and so on. We can have more than one object of the same type, hence the names in plural, “Section 1s”, “Section 2s”. Now let’s take a look at the landing page template, or landing page App as they call it in the Cosmic JS’ website. That’s all. I enjoyed very much working with Cosmic JS and hope you like it too, if you decide to give it a try. Let me know if you have any question or suggestion in the comments below.